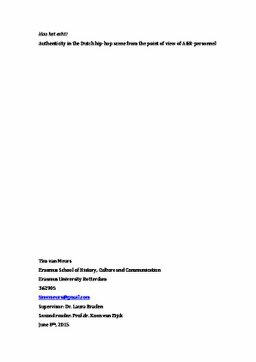 Erasmus University Thesis Repository: Hou het echt! In hip-­‐hop culture, authenticity is a common issue. For hip-­‐hop music consumers it is a way to distinguish certain rappers from others and rappers use the concept to brag about and diss other rappers. Because of its importance within the hip-­‐hop culture, the topic has been studies extensively by academics as well. Studies have looked, for example, at authenticity in hip-­‐hop music from the point of view of consumers and critics, threats to authenticity, and ways in which artists can claim (in)authenticity. No study so far has however viewed the authenticity debate from the first gatekeeper a rapper needs to pass for a professional career: Artist & Repertoire personnel at record labels. As such, this thesis analyzes the way this A&R personnel use the concept of authenticity in their two main activities: artist acquisition and artist guiding. Based on three forms of authenticity (being true to yourself, being true to your audience, and being true to your genre), interviews have been conducted with nine A&Rs at Dutch hip-­‐hop labels. These interviews showed that being true to yourself is deemed most important. When artists change in their personality, A&R personnel argue that this should also be applied to new music. Innovation is thus key. That explains why they think the second or third forms of authenticity are seen as less important; both would result in a form of stagnation. If a rapper does not apply change in personality to his music, he will not stay true to himself, but will only make music to please an audience. When a rapper stays true to the hip-­‐hop genre, this means that there will not be innovation within the genre. The interest in artists that stay true to themselves could explain why consumers or critics call some artists inauthentic after releasing music; the other two forms of authenticity that are not important for A&R managers are the main judging elements for consumption side gatekeepers, while they could see being true to yourself as an artist as renunciation of the audience and genre.